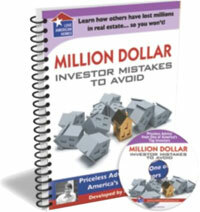 “Million Dollar Investor Mistakes To Avoid” is another information-packed 2 hour video class, but this one is taught by me and my beautiful wife, Shenoah. We cover everything that can go wrong when you’re buying and selling houses, so you don’t trip over the same obstacles we did when we got started. In this program, you’ll learn all the mistakes that we made… mistakes that cost us literally millions of dollars in lost profits. Don’t make the same mistakes we did. Starting out in real estate without this training (or even continuing from where you are now) is like walking into a dark cave without a flashlight.